"True Blue", known as "Idol!! Blue Angel" in the Japanese version, is the sixth episode of the Yu-Gi-Oh! VRAINS anime. It first aired in Japan on June 14, 2017, became available with official subtitles via Crunchyroll the same day, and aired in Canada on September 16, 2018. Skye Zaizen works as a Celebrity Duelist under the alias Blue Angel in LINK VRAINS. In order to gain recognition from her brother, Akira Zaizen, she publicly challenges Playmaker to a Duel in LINK VRAINS. However, Playmaker did not respond to her challenge. Instead, the one who appeared before her is Spectre, who has disguised as her fan! Blue Angel is facing a Duelist in LINK VRAINS with the audience and Zaizen watching. She attacks him directly with "Trickstar Holly Angel", winning her the Duel. She then thanks the audience and logs out, drinking water and watching the sunset, as she does so. Kolter discovers Blue Angel's true identity. At Café Nom, Kolter discovers that the true identity of Blue Angel is Skye Zaizen, the stepsister of SOL Technologies' security manager Akira Zaizen. Yusaku realizes Skye is a student of Den City High School and his classmate. Kolter suggests that he meet her, so that he can get a lead on Zaizen regarding Yusaku's stolen memories and his brother's whereabouts. He starts teasing Yusaku, saying that talking to Skye would be impossible for him. Ai asks why that is and Kolter asks if Ai can imagine Yusaku talking to a woman. Ai agrees that it is impossible, which Kolter accredits to Yusaku's poor social skills (in the dub, they simply tease him about his social skills rather than his skills in talking to girls, as this would require Yusaku to interact with another human being). Yusaku maintains a deadpan expression as he is teased (in the dub, Ai comments that Yusaku will never go through with it). The next day at school Ai asks Yusaku if he likes picking on girls (in the dub, it smash cuts to Ai commenting that he can't believe Yusaku is going through with it), to which Yusaku angrily replies that he does not (in the dub, he cautions Ai to be quiet, since his Duel Disk isn't supposed to have an AI). Ai remarks that at school everybody dresses in uniform, making it difficult to tell them apart (in the dub, he simply notes that all humans look the same). Yusaku tells him to hurry up and find her. Ai scans every area until he finally spots Skye walking. Yusaku follows her, and he sees her entering the Duel Club, but he stares longingly at the door rather than enter. Shima and Yusaku talk outside the Duel Club. Shima catches up with Yusaku, who asks to be reminded who he is. Unhappy about Yusaku forgetting his name, Shima angrily reintroduces himself and Yusaku agrees that they are classmates (in the dub, Yusaku plays innocent about why he's here rather than claim to forget Shima). Shima notices Yusaku's Duel Disk and asks if he came to join the Duel Club. Yusaku says "yes", that this is the room for Duel Club. Shima tells him to not to be dumb and that this place is not for losers, who have no interest in LINK VRAINS. The club president opens the door and scolds Shima for making so much noise and welcomes Yusaku to join, saying that new applicants are always welcome. Yusaku nervously tries to protest that he is not joining, until Ai replies on his behalf, thanking Hosoda, much to Yusaku's dismay. Yusaku introduces himself as a freshman to other members of the Duel Club, who in return introduce themselves to Yusaku, inclulding the club president, Hosoda, second years, Sato and Tanaka, freshman, Suzuki, and Skye. Sato shows him his Duel Disk, which Yusaku pretends to be interested in, saying that this is the latest Duel Disk, which has AI program and gives you support during Duels. Skye remarks that Yusaku knows everything. He tells her that it was Shima who bragged about it earlier. Shima protests, saying that Skye's brother is a big shot at SOL Technologies and he provided all the members of Duel Club with latest Duel Disk. Skye gets angry and frightens Shima with a stern glare. Ai greets the AI programming in Skye's Duel Disk, which returns a greeting, but Ai is disappointed by its lack of social skills (in the dub, he asks her processing speed, and she replies that it's six trillion instructions per second, much to Ai's shock, who claims that his is six trillion and one). Skye notices Ai which causes him to panic and return back to normal. She also notices Yusaku has a card-loading Duel Disk, the same as Playmaker. Yusaku gives her a stern look. Shima suspects that Yusaku must be copying Playmaker and wonders why Playmaker using the old card-loading model (In the dub, Skye does not suspect Yusaku to be Playmaker). Skye asks to see Yusaku's Deck, but is scolded by Hosada, who considers the question to be rude. However Yusaku is okay with it and politely hands his Deck to her. After looking through the cards, Skye thanks him and is about to hand the Deck back, but it is snatched by Shima, who looks through the Deck, which contains "Neo the Magic Swordsman", "Hoshiningen", "Black Pendant", "Goblin's Secret Remedy", "Reinforcements", and "Trap Hole". He calls it a lame old-school Deck, and is promptly scolded by Hosoda, who gets him to apologize for insulting Yusaku's Deck. Shima grimly returns the Deck, as he apologizes (in the dub, he is more sincere). Yusaku says it is fine and agrees with what Shima had said. Hosada gives lessons about the differences between Master and Speed Duels, during which Ai commends Yusaku for showing them a dummy Deck, but Yusaku hushes him, since the lesson is ongoing. After school Yusaku silently watches the sunset before he walks home. Skye arrives at her apartment. She is greeted by the house's maid robot, who informs her that Akira will not be coming to home today, due to work. Skye ignores her, leaves her bag in the sofa and turns on the TV, where she is surprised to see Akira in the news. Akira is asked about Playmaker's Duel against The Gore and he feigns ignorance, hiding that he was responsible for setting it up. When they asked if there would be a match between Playmaker and Blue Angel, Akira says it would never happen, causing Skye to turn off the TV. Skye sits sadly on her bed. At night Skye got a call from Akira he then asked her why she is unhappy.He then advises her to quit speed dueling because it's dangerous and if something happens she could die, and she coldly agrees with him. Akira explains that he's saying this because he cares for her deeply (in the dub, his speech is more natural, as he continues to admonish her about the risks). After hanging up, Zaizen wonders if Skye really understands (in the dub, he muses that he's only looking out for her). Skye then muses to herself that she just want Akira to know that she is independent and responsible and can take care of herself. She then becomes determined, vowing to prove to Akira that she is stronger. Sitting down on a couch, she logs into LINK VRAINS. Yusaku refuses to Duel Blue Angel. As Blue Angel arrives in LINK VRAINS, she turns down many Duel requests and vows to herself that she will defeat Playmaker and prove to Akira she is strong. Frog and Pigeon notice her, and Frog orders Pigeon to start rolling. With their help, Blue Angel issues a public challenge to Playmaker, exciting her audience, as Kolter, Yusaku and Ai watch on. Another man comments that he wishes that he could see The Gore vs Blue Angel. Blue Angel encourages Playmaker to come out from wherever he is and Duel her now. Ai suggests that Yusaku should accept her challenge, but Yusaku refuses for three reason; as his only lead to SOL Technologies he doesn't want to hurt her, he only fights against the Knights of Hanoi, and he wants to keep a low profile. Ai protests that he should still accept her challenge, and Yusaku replies that Dueling her would be a waste of his time (in the dub, Ai calls him chicken to sum up his reasons for not fighting her, and Yusaku snarks that it's an excellent analysis as usual). The MC then declares that Playmaker vs Blue Angel is going to be an interesting Duel, and Playmaker isn't a real man if he doesn't accept her challenge (much to Yusaku's embarrassment). In the Knights of Hanoi's base, Varis and Spectre watch Blue Angel's challenge. Varis comments that it's an interesting turn of events, before giving an order to Spectre. Spectre infects Blue Angel with a card. With Yusaku refusing to log in, Blue Angel is left waiting for Playmaker to show up for a long time. Losing his patience, Frog tells her to notify him if Playmaker accepts her challenge before leaving. She then senses a presence, and she turns to see Spectre standing in the shadows (in the dub, Spectre comments that it's rude for a gentlemen to stand up a lady). Spectre approaches her, claiming to be her fan but she realizes that he is lying (in the dub, she realizes that he's a Knight of Hanoi right away; Spectre admits that he is, but that he's here as her fan first). The area around them transforms, becoming a dark world full of data as Spectre's image enlarges and then dissipates, reappearing all around her as he claims that he can bring Playmaker to her. As he continues to disappear and reappear around her, he throws a card towards her, and she turns just in time for the card to strike her, surrounding her in purple light. Spectre tells her that this card will grant her most desired wish, and he wants her to defeat Playmaker with it. He leaves, telling her to Duel well, and Blue Angel cries out in pain as the light is absorbed into her Duel Disk. The dark world fades, leaving Blue Angel in the cityscape, and she wonders what happened to her. The next day as Yusaku walks to school Ai reads various posts of people making fun of Playmaker for not accepting Blue Angel's challenge, calling him a chicken and a coward, and that true Duelists would accept any challenges. As Ai attempts to read more, Yusaku tells him that's enough. Ai teases him that he is worried and upset. Yusaku notices Skye approaching, and him he warns Ai to be quiet. Skye greets Yusaku, and he greets her in return. Ai greets the AI in Skye's Duel Disk, but she angrily tells him to stop acting as if they were friends. Ai realizes that something is wrong. As Yusaku and Skye walk to school she then asked him why he joined the Duel Club. Yusaku asks to her what Shima said about her brother in response, and Skye bitterly assumes that Yusaku wanted something from her brother, and she tells him that people only approach her to ask her brother that they wanted a new Duel Disk or a job at SOL after graduation. Yusaku tries to protest, but Skye tells him to not to try as her brother won't trust her, and she runs off. As Yusaku and Ai watch her go, Ai tries to talk to him, but Yusaku brushes him off. As Yusaku gets into class, Ai continues to try to talk to him, but Yusaku just tells him to be quiet. Ai tells Yusaku that a Knight of Hanoi has showed up in LINK VRAINS, much to Yusaku's surprise. Later in class, Skye receives a message from Playmaker, claiming that he has accepted her challenge. She then excuses, claiming that she needs to go to infirmary. 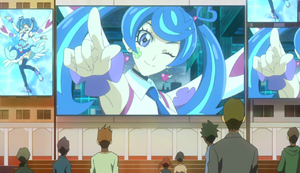 She heads up to the rooftop to log into LINK VRAINS, while Yusaku logs in from the balcony outside the Duel Club. Playmaker and Blue Angel face off. As Playmaker arrives in LINK VRAINS, he asks Ai where the Knight of Hanoi. Ai states that the Knight should be nearby, but to Playmaker's shock, Blue Angel is standing in front of him. She tells him to not to play dumb, as he sent her a message that stated that he wanted to Duel her. Playmaker then realizes that Ai send her the message, and he is angered at the notion that Ai tricked him. Ai protests that he isn't tricking him, and that he sensed that Blue Angel had a Hanoi card in her Deck (in the dub, he calls it a whiff, and comments "P.U.!"). Playmaker wonders why Blue Angel would join the Knights of Hanoi. Ai points out that Hanoi are using her to lure him out (in the dub, he wonders what "P.U." stands for, before deciding that it doesn't matter). Playmaker is surprised, noting that he never thought of her as an enemy, but he's willing to Duel her. Blue Angel declares that the real Duel is just getting started. As Playmaker and Blue Angel prepare to begin their Speed Duel, Summoning their Duel Boards as the Data Storm the MC declares that the legendary Duel of LINK VRAINS between Playmaker and Blue Angel has finally began. Watching from Café Nom, Kolter reacts in shock until a customer interrupts him and orders a hot dog and french fries, and Kolter tells her to wait (in the dub, he politely agrees, but tells her off for calling them sandwiches) and wonders why is Yusaku doing this. Meanwhile in class, Shima wonders where Yusaku went, irritated that he is ditching class. He then turns his tablet on and sees Playmaker preparing to Duel Blue Angel. Excited, he screams that this is getting real, prompting his teacher to scold him. Shima apologizes to her, and muses to himself that Playmaker vs Blue Angel is like a dream come true and is going to be awesome. Playmaker and Blue Angel declare "Speed Duel! ", and the MC declares that the Duel is getting started. Blue Angel's fans excitedly cheer her name. Ecstatic that her audience are cheering for her, Blue Angel declares that the real Duel is just getting started. Duel is shown from an unspecified turn. "Trickstar Holly Angel" attacks Blue Angel's opponent directly (unnamed Duelist: 300 → 0 LP). Spanish ¡La idol Blue Angel! ↑ This card is given to Skye by Spectre. #032 "The Tower of Hanoi"
#035 "The Other Lost Incident"
#037 "Out on a Limb"
#045 "Duel in the Extreme Domain"
#046 "The Circuit That Draws the Future"